On Saturday 24th March, Toby set out to challenge Mount Buffalo by setting his sights on reaching the summit before lunch time that day. He had been training for months to reach his goal and wanted to raise much needed funds to support Country Hope in the process. Toby smashed his goal reaching the summit in only 2 hours and raised a wonderful $2,135.00. What an extraordinary effort! Toby is hugely aware of how lucky he is to live in country Victoria and for his family to be happy and healthy. He is also aware of how tough things can become for a family when facing serious illness. He knows families who have been through such battles and he understands how it takes its toll. I guess in choosing Country Hope he thought that maybe he might be able to give back to families doing it tough in rural areas. Toby also loves a challenge and found he was a feeling a little aimless with his fitness last year. He also has a passion for cycling so Buffalo seemed like a perfect goal. There has been a huge amount of support from various businesses and individuals. Dawn Tukuniu and her business Rekreate, Brendan Murray and Kensho Endurance and also all the team at The Empowered Studio Rutherglen. These guys all helped him through the training and on the day. 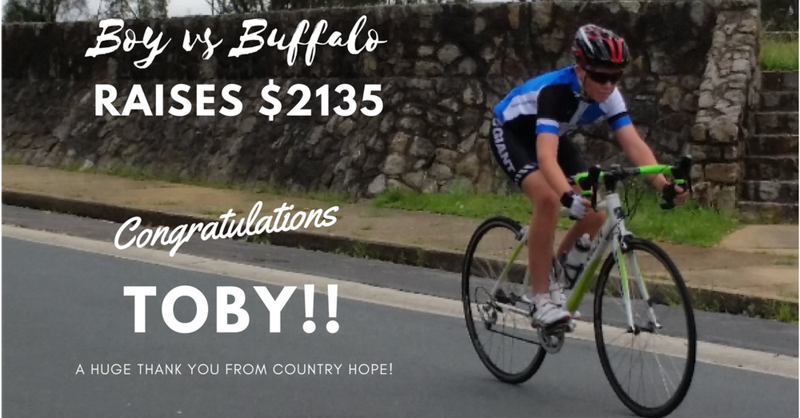 A great big thank you and congratulations to Toby from all of us at Country Hope! We can wait to see what you achieve next year!